STEM Friday: Max Axiom is Back! 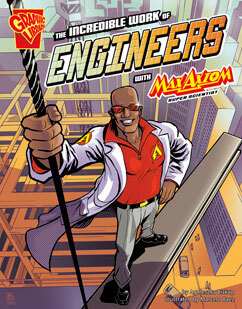 Kids’ favorite super scientist Max Axiom is back in a brand new graphic nonfiction series perfect for STEM studies, Graphic Science and Engineering in Action. For those that need a reminder on Max’s backstory… Using the powers he acquired in a freak accident, Max has the ability to shrink to the size of an atom or ride on a sound wave. Equipped with his sunglasses (giving him x-ray vision) and lab coat (allowing him to travel through time and space), Max Axiom demonstrates and explores concepts in ways never before experienced in the classroom. Max illustrates the how’s and why’s of science, making difficult concepts accessible to readers. 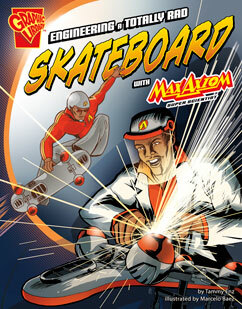 In Graphic Science and Engineering in Action, Max Axiom is on new missions, from using the engineering process to design and build a skateboard and recycling center to learning more about the amazing careers in science and the incredible work of engineers. Readers see firsthand how cool and exciting science can be! Kids who love science with Max Axiom will love our new poster too! We’re giving away copies on the Capstone Connect blog, so head on over there and enter for your chance to win one for your library or classroom! This post is part of STEM Friday, a collection of children’s Science, Technology, Engineering, and Math books. Check out more book reviews from STEM bloggers in the comments section of this post. Copyright © 2012 Jennifer Glidden All Rights Reserved. Categories: STEM Friday round-up | Tags: graphic nonfiction, Graphic Science and Engineering in Action, Max Axiom, STEM Friday | Permalink. What a fun way for kids to learn about careers in science!